More than $75,000 worth of Grateful Dead memorabilia has been stolen from an Illinois auction house, officials say. Randy Donley, owner of Donley Auction House, said the theft was first discovered last month, more than a week after the Grateful Dead Jubilee Auction had taken place. The items were waiting to be picked up or shipped to their new owners at the time of the theft. 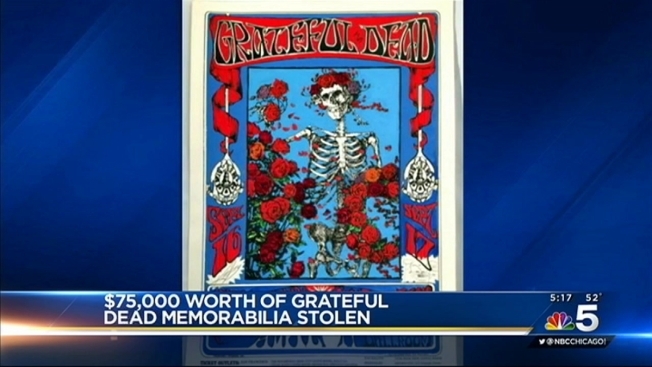 Among the stolen items was a hand painted 1966 Stanley Miller/Alton Kelley Family Dog painting of a skeleton with roses—an image that became a symbol for the Grateful Dead. The iconic piece was valued at an estimated $66,000. "I think the Stanley Mouse piece would be too famous to be resold," Donley said. "It is a one-of-a-kind. It would be pretty tough to put it on the market again." Also stolen were six other Grateful Dead posters. Donley said it’s not clear how exactly the pieces were stolen as the thief managed to evade any surveillance cameras and never set off the building’s alarm. "It’s a mystery," he said. "There are no clues at this point, I don’t know. I hate to sound so vague but we just don’t know. I’m still in a state of shock. I can’t believe it happened." While insurance will likely cover some of the costs associated with the theft, Donley said his main goal is to get the pieces back and has offered a reward for their return. Anyone with information on the theft should contact the McHenry County Sheriff's Office at 815-334-4750 or Crime Stoppers of McHenry County at 1-800-762-7867 (STOP).